For nearly 20 years we've been sharing the goodness, of our farm fresh dairy products. We believe you should be able to read the ingredients, and understand what you are eating, so we use all natural ingredients to formulate our own recipes. We don't homogenize or separate the milk. It's real, unprocessed. We are family. Three generations strong. Our passion for making wholesome dairy and skincare products is the heartbeat of our farm. We are family owned and operated since 1999. We believe in bringing the goodness of nature from our home to yours. Q: Why is your milk different? Almost all milk is separated and homogenized. We don't do either. Q: What does "separated" mean? Separation is a process where they take all the cream out of the milk and add it back in to achieve the 1%, 2% & 3.25% that you see in stores. They add synthetic vitamins back in the milk to replace what has been taken the during the process. We don't do any of that. Q: What does "homogenized" mean? Homogenization is a process where they pressure treat the milk so the cream won't raise to the top. Some say the fat molecules are harder to digest after that process. Either way, we don't do that. Q: Why don’t you make Half & Half or Ice Cream? We do not currently have a separator, all of our products are cream top. The milk that we get from our cows is untouched except for the vat pasteurization process that it goes through. Q: Is your milk A1 or A2? We have A2 milk. We have been breeding A2 cows for a decade and started the process of testing and documenting the animals. Q: Do you sell outside of Washington State? Currently we are not licensed to sell outside of the state of Washington. We will be going through the process to get our permits shortly though! Q: What breed are the cows that you use? Our cows are Jersey and Guernsey. Q: Do you practice safe and humane animal husbandry? Yes we do! We love our cows and we understand the importance of keeping our cows happy and stress free. Happy and relaxed cows produce more milk with a higher cream content. Our cows are pastured whenever weather permits. When they are not out in the pasture, they are fed fresh silage cut from our own fields. They are kept warm, dry, fed, and happy! Q: Where are the goats? As we’ve grown, we don’t have the capacity on our original farm site any more and we partnered up with the very family who got us started in goats years ago. They are pastured and very well taken care of. Q: Are you non GMO? Yes we are! We are currently in the process to get the Non GMO seal. Hopefully you will see it soon! Q: What is the difference between yogurt and kefir? The beneficial bacteria found in yogurt help keep the digestive tract clean and provide food for the friendly bacteria found in a healthy gut. They pass through the digestive tract and are called transient bacteria. The bacteria in Kefir, on the other hand, can actually colonize the intestinal tract. Kefir also contains a far larger range of bacteria, in addition to containing yeasts. Q: Why is yogurt good for you? Q: Why don’t you make greek yogurt? At this point, we don’t have the needed equipment for greek yogurt. In addition to stronger antibodies, Kefir supports detoxification by flooding the digestive system with probiotics. Because it provides more probiotics than yogurt, Kefir provides an easy and drinkable way to get your daily fill of probiotics and improves digestion of lactose. A great boost of calcium and protein for building bone density and muscle. Plus, it’s packed with essential vitamins like vitamin B, Vitamin K, Folic Acid, Magnesium, and Potassium. 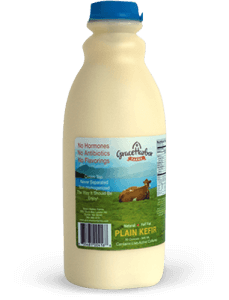 Kefir can also treat and improve common digestive problems such as irritable bowel disease, gastric disease, and heartburn. It can even be used as a sleep aid, contains Tryptophan, an amino acid proven to improve sleep. All prices are in USD. © 2019 Grace Harbor Farms.